Welcome to Erk Pod episode 546. Erk’s June 2014 Wanderer comes to an end with Erk flying home to Melbourne via Sydney. It has been Erk’s shortest international trip but one that has been action packed. Rather than going straight home, Erk is off to an ice hockey game in Melbourne! Erk hopes you have enjoyed listening to his trip even though the episodes have taken a while to be released. Welcome to episode 7 of On The Rails With Erk. On this episode, Erk goes back in time & rides the Puffing Billy Railway in Melbourne between Belgrave, Menzies Creek & Emerald. Many of the staff are volunteers (over 900 volunteers!) and the line runs in difficult country in the Dandengong Ranges. Originally serving as the area’s main transport link, the 100 year old railway is preserved & runs as it would in the 1920’s, there are several services every day with the exception of Christmas Day. Riding a current day suburban electric train to or from Belgrave is a great way to contrast with this train. Allow 1/2 a day as a minimum if you are in Melbourne. Welcome to episode 20 of Erk To The Diary Room. Erk is in Melbourne for his birthday & visits the location of Channel 9’s The Block: Sky High & chats about other TV shows he has been watching. He also goes to a Melbourne landmark for a visit. There is a bit of a crossover between the latter part of this episode of Erk To The Diary Room & Erk’s travel podcast Erk Pod. 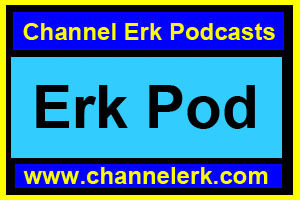 Erk had not finished releasing Erk Pod episodes from his trip to America in January/February 2013 so featuring content from August 2013 on Erk Pod in the middle of the American content would have been strange. Welcome to episode 383 of Erk Pod. Erk is preparing to leave Melbourne & is at Melbourne Airport. In what is turning into a tradition when Erk visits Melbourne, his final podcast in Victoria is from the airport.